On opening the box, I found the order receipt on top of a dozen daylilies from Oakes Daylilies. They were from my wonderful, sweet, thoughtful sister in Virginia. I was so surprised. The plants were in wonderful condition. Last time she was in town, we talked about Oakes, and she said she had ordered from them before. She stated that the plants were big and grew quickly into vigorous plants. I said I might give them a try, but never did. Now, I have some Oakes daylilies, and can’t wait to thank my loving sister when she comes to visit next week. I know what I’ll be doing tomorrow – Planting daylilies. February is almost over. I can’t believe it. It seems as if we were just putting away the Christmas decorations, and now St. Patrick’s Day is bearing down upon us. So, now it is time to think about what needs to be done in March. 1 Take time to enjoy what is blooming in the garden now. 2 Start planting annuals to camouflage the fading foliage of spring flowering bulbs. 3 Divide, repot and fertilize hanging baskets of ferns. 4 Start planting annuals for spots of color. 6 Divide perennials esp. the ones I didn’t get to last year. 7 Plant more cannas, dahlias, and gladiolus bulbs. 8 Fertilize lawn, camellias, & roses. 9 Watch out for baby black and red grasshoppers & destroy. 10 Sit back and enjoy the garden. Now if I can only get all of this done before April’s checklist needs to be done. There is one plant that always reminds me of pina coladas every time I touch it. The heavenly-scented herb I am referring to is pineapple sage( Salvia elegans). It can make a hot summer day seem cooler by just rubbing your hands on the foliage and releasing that cool, pineapple scent. But, that’s not all, it makes a great garnish on pina coladas and pineapple sherbet and can be used to make an herbal tea. The fantastic aroma isn’t the only nice thing about this plant. It has dozens and dozens of bright red blossoms that attract hummingbirds and butterflies. Down South it will start blooming in the early summer. It also grows very quickly and makes a nice mounded plant about three feet high. I have grown the regular variety for years, and it just can’t be beat. It is a tender perennial which is supposed to be hardy to 20 degrees, but I have had it overwinter with no problems. Of course, I cover the base with a thick layer of pine straw. I have read where it often will return from the roots after a hard freeze. It is very easy to propagate this sage. 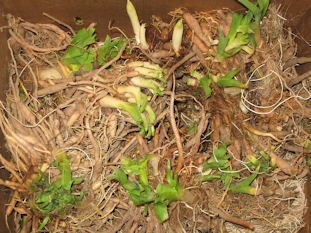 Cuttings root quickly in water; they have also layered themselves in the garden. Last year I found a variety called “Golden Delicious” which has chartreuse to gold leaves. I planted this in the same bed with a Marguerite sweet potato vine, and the two complemented each other nicely. I cut back the frost damaged stems in late December, and already it has put out a tremendous amount of new growth. This is a great plant to have in your garden, just make sure you have it where you can reach out easily to rub the leaves to release that pina colada smell. We have our first peach blossom. 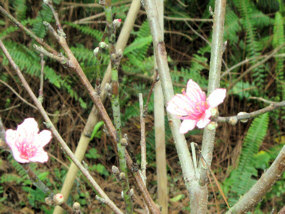 My dear hubby bought two peach trees last year, and one is showing its flowers. We have grown citrus trees and a Bartlett pear, but this is the first attempt at a peach. He planted two varieties that are supposed to do well here. I think they are worth it just for the flowers. They are a beautiful pink. I can’t wait for more flowers to pop out. We were able to put these in since we have more sun now that we lost some large pine trees. We lost a large River Birch tree also, and we are hoping that these trees will provide some shade for the house when they get larger. I don’t know if we will get any fruit this year since they were just planted last summer. I know it usually takes two to three years for a tree to bear fruit. There may be another reason there will be no eating of peaches even when they do bear fruit. Hubby insisted that we plant them near the bird feeders. I tried to remind him that any fruit would be eaten by the birds, but he went ahead and planted them there anyway. You just can’t give advice to some people. Well, for once I got home early from work and with the longer daylight was able to work outside for almost two hours. I worked on the circle garden. Bulbs and other plants are already popping up, and I want the area to look neat and tidy when these do bloom. I cut out the two Orchid Trees (Bauhinia) that bit the dust with the last freeze we had. I had grown these from seed and they were about eight feet tall. It was sad to lose them, but I knew when they were planted that it was marginal that they would survive here for very long. With these two plants gone, the Butterfly rose (Mutabilis) was a little floppy. I didn’t realize that the Orchid Trees were helping to support it. So, this too was pruned back and tied to a small trellis that my sweet daughter had given me a few years back. Since I had just cut back some ginger that this trellis had been keeping from falling over into the lawn, it was now available to place elsewhere. I also cut out the dead portions of the Bulbine which was about 2/3 of the plant. My yellow lantana is coming back, so I trimmed all the dead branches off. I raked all the leaves, pine needles, and pine cones from the outside edges and the path in between. The next thing to be done was the picking up of all the leaves in the beds themselves. My hubby has made me a stick with a nail in the end, and this tool makes stabbing and picking up leaves in a garden bed a snap. After putting away the lopers, rake, and clippers, there was only one thing left to do. I walked back to the area and just enjoyed looking at the cleaned up garden. I had used my time well. 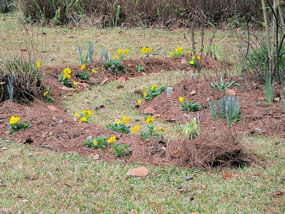 The bright yellow pansies, yellow daffodils, and the neatly trimmed plants were a very nice sight to behold. 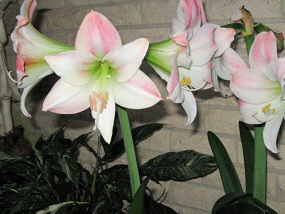 These are the Apple Blossom amaryllis I showed in an earlier post. All three are in bloom now and make a lovely, fragrant front porch show. Children love to go on field trips. They love the idea of getting out of the regular routine and doing or seeing something new. Adults are not any different. We need to change up our routines and get out occasionally. With that in mind, my sister and I struck out for two of our favorite nurseries yesterday. The first stop was McClendon’s about thirty miles away. They are reopening hopefully for the whole year. (Katrina damage made them only spring/fall the last two years). The reason this nursery is so good is that they have many plants that you hear or read about, but you never see anywhere. The first thing I saw was a large pot of Winter Honeysuckle. I had just read a posting about this on Dirt Therapy. Here, Phillip writes about the wonderful aroma of this plant, and he wasn’t exaggerating. I was happy to get this plant after reading about it. Check out Phillip’s blog to see a full grown specimen. Next, this very nice and knowledgeable man showed me another sweet fragrant plant, Sweet Almond Bush (Aloysia virgata). This reminds me of sweetspire just with smaller flowers. This one also smells just heavenly. It perfumed the air in the car with a very delicate, not overpowering, scent. After this both my sister and I bought Yellow Shrub Jessamine. I grow Night Blooming Jessamine, and this seems similar. According to what I have read on the Internet this was a favorite in the Victorian Era. It is also supposed to attract hummingbirds and butterflies. This probably will freeze and come back from the roots, so that should keep it in bounds for I read it can be rangy. I plan on planting two of these in the circle garden where I have planted many other yellow flowers. Lastly I bought a Queen’s Wreath Vine (Petrea volubilis) on the recommendation of that sweet worker. It is a tropical vine, but I have read that it has survived temps in the high 20’s. I may plant it in a container or in a very protected area. My sister also bought some varigated bamboo. Next we headed off the Denham Springs, about another twenty miles, to Clegg’s Nursery. This is a large operation with some of the best plants. We both bought some Mexican Bush Sage, and I found some white Katie Ruellia to put in the white area of my side garden. I figured this would be good during the summer, after the Easter Lilies bloom. Next, I selected two white crinums that will go in the same area. I have a large pink one close by, so I know these should do well there. I also bought two Texas Bluebonnets. I thought I would give them a try and see how they do. If they do well, I may try more next fall. Lastly, I was thrilled to find Midnight Flare azalea. I planted three around a Bradford pear tree about two years ago. They did well but more were needed for a good display. Last March I bought three more to fill out the area, but one did not make it. Even though I watered the area, I think the long period of no rain was too much for that one. So now I can finally replace it with the new one which luckily is the same size as the others. My sister also bought some opium poppies (I didn’t think you could sell that) and some herbs. I planted many of my purchases today. I did not have time to do the bigger pots since I spent a good part of the day cutting back some freeze damaged plants. But, tomorrow I am hoping to finish up planting those I didn’t get to today. Can’t wait for our next field trip – March 15th. With the warmer temperatures and rain we have been experiencing lately, the garden is starting to come back to life. Instead of seeing one flower here or one flower there, we are starting to see a whole garden beginning to show real signs of springtime. On one side of the front walk, the petunias, gerber daisies, and nicotiana are all starting to show multiple blooms. The red amaryllis buds are starting to poke up also. The Aztec Grass already has new growth about five inches tall. When you work five days a week, it is sometimes a surprise to see the changes that have happened by the weekend. 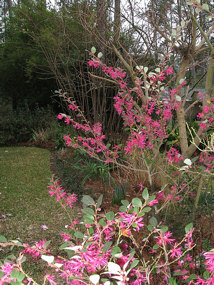 Here is a photo of one of the side gardens with the loropetalum in bloom. For several years a very good friend had tried to tell me how good this plant was, but I just never really gave it a thought. Then one day, I saw a row of them about fifty feet long, and I was impressed. So, finally I had to admit she was right, and I should have listened to her when she first told me about them. With all the changes that I have noted this weekend, I can hardly wait to see what will happen in the garden by next weekend. A few years back, when we had more trees and less sun, I decided to make a new garden in one of the few sunny spots around. So, in the early fall, I made a circle bed about ten feet across and filled it with all the plants that were doing poorly because of all the shade. 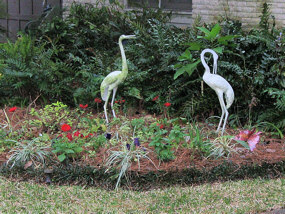 I put in daylilies, Louisiana Irises, Madonna lilies, a camellia, and a rose bush. I was hoping that they would do better in new soil and sun, and I was not disappointed. They all immediately began to grow and thrive. I finally had some flowers besides impatients. To make this bed, I dug up the grass, put in some amendments, layered garden soil on top of that and then worked it all in. This was hard work because of the clay soil we naturally have. Then in the early winter, I added some daffodil bulbs, which did well. The following spring I put in some dahlias. Most of the plants were yellow, so I decided to make this garden mostly yellow. Since then I have added a yellow native azalea, and more yellow daylilies like Custard Candy, Stella d’Oro and a yellow La. Iris. I also have some other colors beside yellow to prevent monotony. I plant some summer annuals that are white or a light pink, and there is also Plum Tree Daylily and Coral Nymph salvia. In the winter, I always put in some sort of yellow annual – pansies or snapdragons. After about two years, I decided to add to outer half circles to the area. I placed them about two and a half feet from the circle. They are about two feet wide. In the front half circle, I planted Stella d’oro and Happy Returns daylilies, some small amaryllis, sea holly, and Mexican Bush Sage. The back circle was just finished when a friend dropped off about 18 large amaryllis bulbs. They were red, but I had no other place to put them so into this bed they went. Because very little is blooming when the amaryllis do, there is no clash of colors, and so this is where they have stayed. About a week after the amaryllis were dropped off, my husband came home from a fishing trip, and his buddy had given him some La. Irises. These too needed to be planted right away, so into the bed they went. They are a soft violet and even though other flowers bloom when they do, there is no clash of colors here either. Everything seems to blend nicely. Here is a picture of half the circle garden I took recently. The pansies are giving some color, and the daffodils seem ready to open. I’m thinking about adding another set of half rings this fall. If I do, I know I will have to redo the entire garden to place the shorter plants to the outside. We’ll see how ambitious I am when September rolls around. 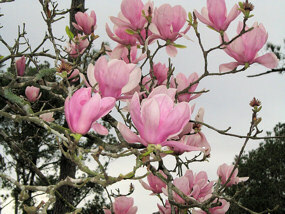 One of nicest signs of late winter or early springtime is the emergence of the Japanese Magnolia’s flowers. This small deciduous tree is also known as the Saucer Magnolia. They are now blooming all over the neighborhood. I do not have one in my garden, but one of my neighbors has two of them right next to our adjoining property line. So, I get to enjoy the blooms every year. These trees make a very dramatic display since the flowers appear before the leaves. The ones next door are about eighteen feet tall and are prolific bloomers. When the flowers open, they remind me of tea cups sitting up on the tree branches. Another thing I like about this magnolia is the color of the flowers. The pink blossoms are so striking against a bright blue sky as well as a gray one. These are very old trees. They were about the same size as they are now when we moved in 30 years ago. The original owner did a fantastic job pruning these trees. Their leafless branches make for an interesting winter scene. 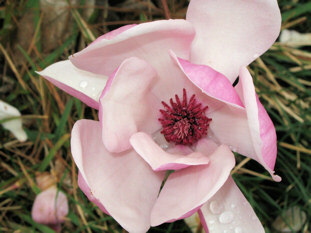 The showy blooms are about five to six inches across with a very pale pink interior and a dark pink exterior. Some of the flowers are on low branches so the individual bloom can be seen and enjoyed. I think these flowers are so lovely. I even enjoy them when they fall on the ground. All the pink petals on the green lawn make a pleasing still life picture. When the flowers on the azalea Rosebud open, they really do look like rosebuds. The flowers are doubles, almost two inches across. I bought my first one about 5 years ago. It has rosy pink blooms and has grown to about three and a half feet tall. When it does flower, it is covered with masses of blooms. It blossoms a little after all the other azaleas do. So far this year the buds are still closed tight. I have this plant in the front of the border because it has flowers that need to be seen close up to be appreciated. Everyone who see it is enthralled with the flowers, and I have even cut some flowers and put them in small vases for the house. It looks like miniature roses arrangements. Last year I found another one at a local garden show. This one was called Amelia Rose. It is a medium purple. It is still a small plant (maybe 2 feet tall), but it is already blooming. This one, too, I have placed in the front so that it can be seen easily. 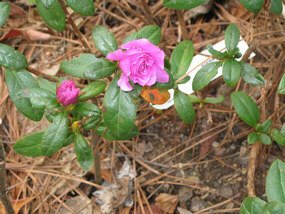 Both of these azaleas need the same growing conditions of all azaleas. Give them well-drained, acidic soil, with some afternoon shade, and they thrive. These two rosebud azaleas have become some of my favorite plants.